Toronto is one of the best cities in North America to live and work. City boasts one of the highest standards of living in Canada. It is one of the business, entertainment and political centres of the Canada. Finding a permanent job in Toronto sometimes can be very frustrating, tough and disappointing, especially if you are foreign citizen and don’t live in the city, don’t have connections or your profession is not in-demand. That’s the reason, why it may be recommended for foreigners to start with a temporary job or an internship in Toronto. Before you start looking for a job in Toronto, you should get information about wages, requirements, working conditions and benefits for particular occupations and professions in Toronto. The best source for this is JobAndSalaryAbroad.com website. Canadian economy is facing a shortage of workforce, meaning those people seeking Canada immigration have an great opportunity. With an almost 50% of foreign-born population, Toronto is among the most diverse cities in the world. It is a city with the second-highest percentage of foreign-born population in the world, after Miami, Florida. There is no single nationality or culture that dominates Toronto’s immigrant population. Toronto is the leading tourism destination in Canada, it is a place with the greatest concentration of food and beverage producers in Canada, music centre of the country and the business and financial capital. Food and beverage producers in Toronto area employs more than 64.000 workers. Some of the well known companies in this sector are: Coca Cola Company, Nestle Canada, Mondelez International, Kraft Heinz Canada, Unilever Canada. Occupations like production assembler, auxiliary worker, heavy truck driver, loader, butcher are among in-demand professions in this sector. Tourism sector is well developed in Toronto. City offers unique attractions and events, welcoming over 40 million visitors every year. Tourism sector in Toronto employs professions such as hotel animators, receptionists, hotel employees, restaurant workers, hotel managers, restaurant managers and many others. There is also high demand in Toronto for an occupations like fuel station attendants, mini truck drivers, couriers, taxi drivers, bus drivers, delivery drivers, construction workers, carpenters, plumbers and many others. 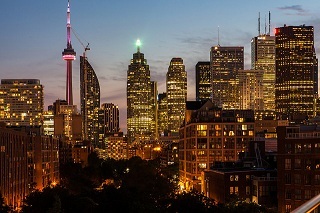 Toronto is a „headquarter city“ and it is recommended place for those people interested to work in ladder-climbing corporations, head offices and international companies. Occupations, such as project manager, marketing manager, engineer, financial advisor, tax advisor, are among in-demand professions in Toronto. Great way to browse Toronto’s job market, especially if you don’t live in Toronto, is to find some of the Canadian job sites like Jobbank, Torontojobs.ca, Indeed, Monster, Workopolis or Jobshark. Another good way to find a job in Toronto is to browse local job boards, where you can see what types of jobs are available in and around the city. There are many available job opportunities in Toronto for a qualified foreigners with adequate working experience. If you are a foreign citizen looking for a job in Toronto, you stand a good chance of finding it, especially if you are fluent in English. Is it possible to find a job in Toronto without speaking English or French? Almost impossible! If you are foreigner and not fluent in English (or French), your options will be limited to low paid jobs. But, sometimes it is not a bad option, you can start with a low paid job, learning English during first few years in Canada and then start looking for the higher paying job. There are some regulated occupations in Canada, mainly in health care sector, such as: nurse or medical doctor, but also in education sector, for example – teachers. Other occupations usually are non-regulated, but As a foreigner in Canada, you may also need a recognition of you qualifications.